This innovative post is based at Ulverston Parish Church, but works across Furness with a dedicated team of professionals and volunteers. We are pursuing a hub and nodes strategy, with Ulverston as the hub and different groups meeting across the area in schools and other locations. 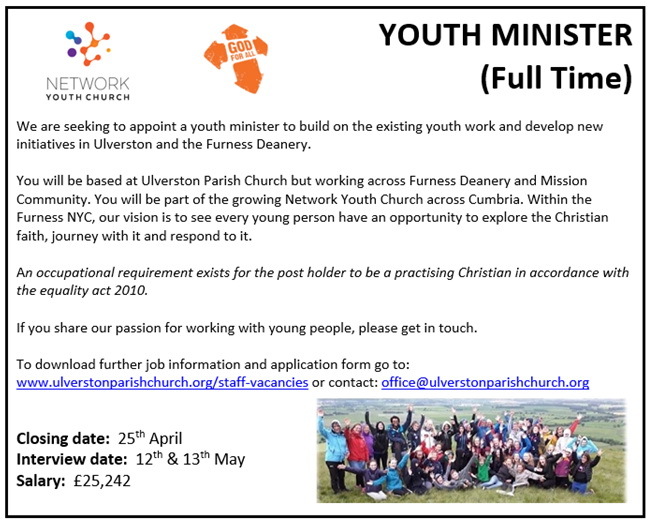 To give all young people in the Furness area the opportunity to hear the good news of Jesus Christ in such a way that they can understand it and respond to it. To disciple those who respond in an age appropriate way, so that they can grow in their faith and share it. To build a new form of church with and for young people, which is both connected to traditional church and distinct from it. You are welcome to download the relevant documents here, or alternatively contact the church office for hard copies of documentation and application forms. Closing date for applications: 25 April 2019. Interview dates: 12 & 13 May 2019. This post is a key interface between the church and the wider community. The post-holder should have a sympathy with and understand the ethos of the Church of England, and will be expected to work actively to support our ministry and vision. The position requires the ability to work in a busy and variable environment, where multi-tasking, sound decision making, a proactive approach, and discretion are essential. The post-holder will need organisational, communication and interpersonal skills, and the ability to work well with others. 22 hours per week, based in the Parish Office, Church Walk, Ulverston, including office opening hours (weekday mornings). Interview date 16 April 2019.